As consumers, we are bombarded with products that have had substances added that make them more appealing to the buyer as they are believed to be more healthy because of these components. Vitamins, minerals and fish oils are all now well known for their health qualities, with some people even taking these supplements in addition to their normal diet, including fish oils. 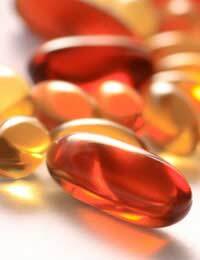 Fish oils are substances that are found naturally in fish. Although the fish don’t actually produce the oil as such, they contain it in their flesh after consuming special types of algae.It has been found that the fleshy components of the fish contain a higher level of omega-3 fish oil than the actual liver from which many products are derived, for example cod liver oil. Science and research has found there are numerous benefits of consuming fish oils, for example, the Eskimos, who eat a high content of fish, but also a large amount of fat, have a very low incidence of any cardiovascular disease or health problems related to diet.There are many experiments past and present that have found the benefits of fish oils to be extremely encouraging.To consume a diet high in this substance or taken as a supplement can help reduce depression, aggression, menstrual cramps, joint stiffness, skin complaints and in some cases, experts believe it can help in the prevention of some types of cancers. Natural sources of omega-3 fish oil include walnuts, soya beans, tuna, salmon and hoki which can be enjoyed regularly as part of a healthy diet. However, experts have also found that some of the fish that contain omega-3 also contain high levels of certain toxins such as mercury, and advise that these fish are only eaten once or twice a week to prevent poisoning from the toxins. This is why many people opt to use a supplementary form of the substance and buy pills or capsules as a way of increasing the amount of omega-3 in their system.Omega-3 capsules can be purchased from many different places. Supermarkets, chemists, health food shops and the internet are all fighting for sales of this substance as it is becoming increasingly popular as the public become aware of the many benefits. How Does Omega-3 Fish Oil Improve Performance? As research continues to provide results demonstrating the benefits for the whole body of this substance, people are now gaining the maximum advantages and consuming fish oils as a method of enhancing cognitive performance.Within the fish oil is a compound called docosahexaenoic acid (DHA) that is thought to improved memory, increase brain functions and delay the effects of aging on cognitive processes. DHA is important in the development of cellular membranes and the protection of nerve cells; one study has shown that supplementary DHA given to newborns improved their cerebral development, though further and more extensive testing is necessary to provide more concrete evidence. Other preliminary evidence has shown that expectant mothers who take a supplement of omega-3 produce babies with better cognitive function and cerebral development also. It is due to this, that parents seem to be keen to add these supplements to the diet of their children, even though further research is needed to prove whether these initial findings are conclusive or not. It should be noted however, that doctors and nutritionalists advise that oily fish consumption should be minimal in the very young due to the increased risk of poisoning from other substances within the fish. The benefits of taking an omega-3 fish oil supplement seem to prove extremely advantageous results with many studies showing a marked increase in brain function.The safest option seems to lean towards taking additional omega-3 in the form of a supplement rather than by increasing the amount of fish eaten as too much may be dangerous. That is not to say that fish shouldn’t be enjoyed regularly, but that it is best consumed within a healthy diet and not eaten everyday.